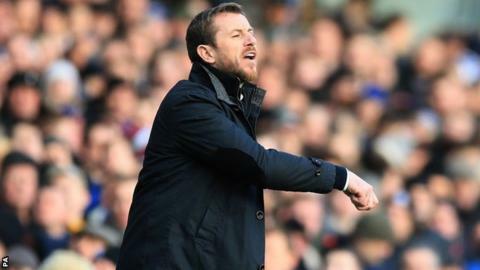 Birmingham City moved clear of the relegation zone to damage Brentford's play-off push at St Andrew's. Blues led when Clayton Donaldson's header at goal was deflected into his own net by James Tarkowski. Brentford, who stay seventh in the table, should have levelled before the break but Jonathan Douglas headed over. Gary Rowett's side had midfielder Stephen Gleeson sent off late on for a stamp on Alex Pritchard, but the visitors could not capitalise. Blues are now up to 13th, 11 points clear of the relegation zone after a timely win which arrived hours after the Football League was assured that the Midlands club have the funds to complete the season. Birmingham's parent company, based in the Far East, is in the hands of receivers Ernst and Young, who have told the Football League that their appointment should not be considered as an "insolvency event". If the League viewed it as such, a 10-point penalty could be handed out, raising the prospect of a relegation scrap. A run of nine games without a win before kick-off had pulled the 2011 League Cup winners closer to the bottom three but Tarkowski's own goal proved enough to earn a return to winning ways. Blues had conceded eight goals in defeats by Brighton and Ipswich before Brentford's visit but defended resolutely. Aside from Douglas's wasteful header from Jon Toral's cross, Mark Warburton's side barely threatened. Birmingham's teenage winger Demarai Gray missed the game's only other clear-cut opening, firing over with the goal at his mercy just after the hour. He tried to make amends late on, shooting wide from a tight angle as Birmingham closed out victory despite Gleeson's late show of ill-discipline. "This is the biggest win of our season. It was an absolute crucial win. To get it against a Brentford side who are going really well under manager Mark Warburton was very important. "I thought we defended brilliantly against Brentford and I thought that with a little more composure and a little more quality and a tab more ruthless play we could have added to the single goal. "Clayton Donaldson was brilliant against his old team. He has been monumental this season and when we play that lone striking role he plays it as well as anyone. He physically imposes himself on the game and is such a great worker for the team. "It was a good move and a good ball into the middle. It is testament to Douglas that he gets into that area. He gets forward and has scored some vital goals for us and I have no problem with him as nine times out of 10 he scores from that position. "We lacked a bit of quality and were not quite at our best. We had a lot of possession but lacked care on the final ball. But this is a tough league. There are a lot of points to be played for over the coming weeks. "We have a chance on Tuesday against Huddersfield to deliver a strong performance and remain in the mix." Match ends, Birmingham City 1, Brentford 0. Second Half ends, Birmingham City 1, Brentford 0. Attempt missed. Alan Judge (Brentford) right footed shot from outside the box is high and wide to the right following a corner. Corner, Brentford. Conceded by Callum Reilly. Substitution, Birmingham City. Lee Novak replaces David Cotterill. Attempt missed. Jon-Miquel Toral (Brentford) header from the centre of the box is too high. Assisted by Alex Pritchard with a cross following a corner. Corner, Brentford. Conceded by Jonathan Spector. Attempt blocked. Alex Pritchard (Brentford) right footed shot from outside the box is blocked. Stephen Gleeson (Birmingham City) is shown the red card. Alex Pritchard (Brentford) wins a free kick in the attacking half. Foul by Stephen Gleeson (Birmingham City). Attempt blocked. Andrew Shinnie (Birmingham City) left footed shot from the right side of the box is blocked. Assisted by Clayton Donaldson. Attempt missed. Alan Judge (Brentford) right footed shot from outside the box is close, but misses to the left. Assisted by Alex Pritchard. Corner, Brentford. Conceded by David Cotterill. Andre Gray (Brentford) wins a free kick on the right wing. Foul by Rob Kiernan (Birmingham City). Substitution, Birmingham City. Lloyd Dyer replaces Demarai Gray. Substitution, Brentford. Alan McCormack replaces Moses Odubajo because of an injury. Delay in match Moses Odubajo (Brentford) because of an injury. Attempt saved. Alex Pritchard (Brentford) right footed shot from outside the box is saved in the centre of the goal. Assisted by Alan Judge. Foul by Moses Odubajo (Brentford). Demarai Gray (Birmingham City) wins a free kick in the defensive half. Attempt missed. Demarai Gray (Birmingham City) right footed shot from the left side of the box is close, but misses to the right. Assisted by David Cotterill following a corner. Corner, Birmingham City. Conceded by David Button. Attempt saved. David Cotterill (Birmingham City) right footed shot from outside the box is saved in the top left corner. Attempt blocked. Andrew Shinnie (Birmingham City) right footed shot from outside the box is blocked. Assisted by David Cotterill. Attempt missed. James Tarkowski (Brentford) header from the centre of the box is just a bit too high. Assisted by Alan Judge with a cross following a corner. Corner, Brentford. Conceded by Jonathan Grounds. Foul by Clayton Donaldson (Birmingham City). Attempt missed. Andrew Shinnie (Birmingham City) right footed shot from the centre of the box misses to the left. Assisted by Demarai Gray. Corner, Brentford. Conceded by Rob Kiernan. Attempt missed. Demarai Gray (Birmingham City) right footed shot from the centre of the box is too high. Assisted by Clayton Donaldson with a headed pass. Hand ball by Andre Gray (Brentford). Attempt missed. Paul Caddis (Birmingham City) left footed shot from outside the box is close, but misses to the left. Assisted by David Cotterill. Corner, Birmingham City. Conceded by Liam Moore. Attempt missed. Jon-Miquel Toral (Brentford) header from the centre of the box is too high. Assisted by Alan Judge with a cross.